Altium Limited, a global leader in Electronic Design Automation, Native 3D PCB design systems (Altium Designer®, CircuitStudio®, PCBWorks®, CircuitMaker®), ECAD design data management (Altium Vault®), and embedded software development toolkits (TASKING®), announces a new release v2.2r1 of its TASKING C compiler suite for the RH850 architecture from Renesas Electronics, delivering support for new RH850 microcontroller variants, code optimization improvements, and an integrated on-chip debugger. Altium recognized a strong interest from its automotive customers to support the high performance Renesas RH850 microcontroller family through its robust and efficient TASKING VX compiler technology. 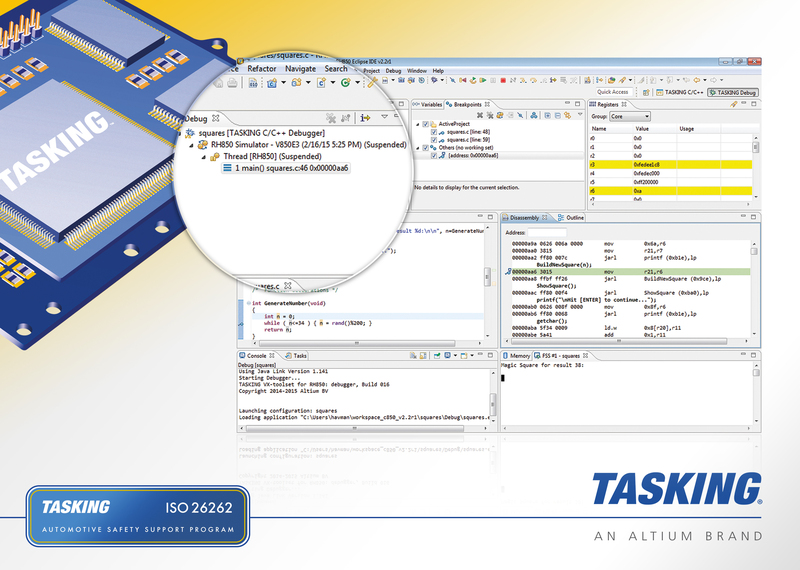 The TASKING compilers have industry leading code optimization techniques and proven-in-use track records in automotive applications like powertrain, body control, chassis control, including safety critical applications. TASKING’s multi-core support implementation was jointly developed with a leading Tier-1 supplier in the powertrain area and is regarded as one of the most well-respected and advanced solutions. The new release of the TASKING toolset brings support for the RH850/C1x, RH850/D1x, RH850/E1x, RH850/P1x and RH850/R1x device variants in addition to the RH850/F1x series that was supported already. While Renesas continues to widen its scalable range of RH850 products, Altium will work with Renesas to add support to the toolset for future RH850 variants, including specialized solutions for new on-chip modules. A major addition to the new release of the toolset is support for the Renesas E1 On-Chip debugging emulator, next to the Instruction Set Simulator debugger. The debugger’s graphical user interface is seamlessly integrated into the Eclipse-based IDE and accessible through the debugger perspective. This brings to the developer a single coding and debugging front-end for RH850 application development, which is both comprehensive and very cost-effective compared to separate solutions. ”Altium’s partnership with Renesas has enabled us to extend the tool suite support for the RH850 automotive microcontroller by support of new derivatives and the support of the Renesas E1 emulator.”, says Harm-André Verhoef, responsible for TASKING Product Management at Altium. "As independent and automotive focussed compiler vendor with proven-in-use technology we serve our customers with the most comprehensive as well as the most integrated development suites, removing the barriers encountered when developing for microcontrollers with multiple cores, enabling our customers not only to get their applications to market faster, but also to create safer applications and at an unprecedented cost-efficient level." New code generation optimizations have been added to this new compiler release, such as MIL linking and code compaction (reverse inlining), techniques that have proven to be highly effective in TASKING’s compilers for automotive microcontrollers. Measurements on a wide range of different application sources, including powertrain applications, show improvements up to 17% in code compactness. The RH850 microcontroller family offers rich functional safety and embedded security features needed for new and advanced automotive applications. Altium supports these features and application requirements through its ISO 26262 Support Program. This includes various cost and lead-time efficient solutions to help customers achieve certification for functional safety standards such as ISO 26262 and others. As part of the certification process a manufacturer has to assess the required level of confidence in the utilized software tools such as the TASKING RH850 toolset. Altium enables this through the availability of a Compiler Qualification Kit as well as optional ISO 26262 Compiler Qualification Services. The VX-toolset for RH850 release v2.2 is available on PC/Windows as of March, with other platforms supported on request. TASKING’s new C compiler for the GTM will be integrated into the toolset later in 2015.